Last week, radio reporter Febe “Bords” Morales of Aksyon Radyo 720 posted on his Facebook wall a photograph of Iloilo Governor Arthur Defensor, Sr. chatting with former 4th District Board Member Mitch Monfort-Bautista with her husband at the Capitol. It was made to look like Aksyon Bords stole a picture through a small opening of the door. But it wasn’t really a scoop; it was a deliberate media leak hatched at the Capitol to show a possible alliance between the Defensor family and Mitch Monfort, daughter of the late Cong. Dr. Narciso Monfort, in the next elections. Far from being kept a secret, the meeting was intended to be leaked to send a message to Dr. Ferj Biron, M.D., the incumbent congressman of the 4th district who is poised to run for Governor against Rep. Arthur “Toto” Defensor, Jr. in the May 2019 elections. From what we are seeing, there is no more turning back for Defensor and Biron. Biron is reportedly fielding one of his sons to replace him as congressman, and the meeting between Gov. Defensor and Mitch Bautista is an indication she will run again and challenge the son. She ran and lost to Biron in the May 9, 2016 elections. Defensor is now sending a message to Biron that the latter’s turf will face a tough challenge. And we can expect Defensor to put up candidates for Congressman and municipal mayors in other districts. Early on, Biron has started courting the support of the congressmen and municipal mayors in the province. A year ago, Defensor Sr. and his son, along with Representatives Arcadio Gorriceta, Biron and Raul “Boboy” Tupas agreed to field a consensus candidate to represent their alliance. Biron was able to gather the commitment of support of most of the municipal mayors in the province. He was quick to claim the title as consensus candidate. But Defensor Sr. backtracked on his commitment for a consensus candidate and announced the candidacy of his son. It’s still a good one year before the elections are held for Governor, but the protagonists can now be narrowed down to just the two: Biron and Toto Defensor. Cong. Oscar Richard Garin Jr. of the 1st District had initially shown interest in becoming the third force in the equation. The controversy over the Dengvaxia vaccine, however, in which his wife Janette played a key role (she was listed as among the former public officials to be charged criminally by the Senate Blue Ribbon Committee) doused cold water on his plans. He has since kept quiet on the gubernatorial race. I was told the Liberal Party commissioned a poll survey firm to get a snapshot of how the congressional battle between two Tupases — Boboy TupasFive and Atty. Gel Tupas — in the 5th district of Iloilo. According to my unimpeachable source, the survey outcome showed the incumbent Iloilo vice governor leading his sister in law by a mile. If elections were held during the survey period two weeks ago, Boboy would have trounced Gel by 4:1. With barely 100 days left before the elections when that survey was done, it shows a hopeless fight for Gel. Her husband, incumbent Congressman Niel “Junjun” Tupas Jr., could not lift her enough to put up a good fighting chance. Gel’s woes are aggravated by the fact that Junjun is also running for vice governor of the province. Her husband would not be able to campaign as hard for her. He has his own battle to fight. Junjun is running against Guimbal municipal mayor Christine “Tintin” Garin, daughter of 1st district kingpin Oscar Garin Sr. The latest surveys showed Junjun enjoying a slight edge over Garin, owing much to the immense political goodwill of the Tupas family name. But Junjun is navigating through hazardous waters. That’s because he is violating a cardinal rule in warfare (and politics is basically warfare): never fight on two fronts. The Garin clan is not about ready to give Junjun an easy slide into the second highest elected position in the province. This early, Garin is bombarding the airwaves with TV and radio advertisements. She is determined to put up a stiff fight. Junjun faces big problems because while Mar Roxas affirmed he is the official Liberal Party candidate and there is no “zone libre” for the vice gubernatorial race, local LP candidates have manifested their open zone policy for Garin. Even Iloilo Governor Arthur Defensor Sr. has announced publicly he will not pressure his municipal mayors to obstruct the campaign of Garin. That in itself is “zona libre” in disguise. In the 4th district, come backing Dr. Ferj Biron AccountTwo is certain to campaign against Junjun. Biron is the official candidate of the Liberal Party. His support for Garin will pull the rugs under his feet because the 4th district was always a Tupas bailiwick. For it to go to Garin will deprive Junjun of a traditional political base. When the campaign period kicks off, Junjun will have to make a tough decision. Does he pursue his ambition to control the 5th district at the same time as his vice gubernatorial bid? Or will he pick one battle and try to win that, sacrificing the other? He only needs to look back in history to know that fighting on two fronts simultaneously is dangerous. Even the most brilliant military strategists, notably Napoleon and Hitler, faltered and failed when they succumb to that temptation. Another problem facing Junjun to his vice gubernatorial campaign is the possibility that his own siblings, and die-hard supporters of his late father, Niel Tupas Sr., might openly campaign for Garin. It would be tragic to see Junjun lose on both fronts. His overreaching ambition, and perhaps greed, will only lead him to damnation. Liberal Parties allies of President Benigno Simeon C. Aquino III in Iloilo province were recipients of a pork barrel largesse of not less than P100 million shortly before the 45-day campaign period leading to the May 13, 2013 elections, documents obtained by TNT Libre show. Included in this package were P14.5 million for “food subsidy, burial and medical assistance, transportation allowance and livelihood programs”, P16 million for “small and medium enterprises/livelihood”, P4.3 million as “educational assistance/scholarship program for 1,720 college students”, and P5.7 million for “educational assistance/scholarship for 11,400 students in high school”. The Province of Iloilo has its own funds in the regular budget for assistance to persons in distress, and this pork barrel package was clearly intended to augment the Capitol’s ability to extend help to more people during the campaign, an official of the provincial government, speaking on condition of anonymity, said. The documents were made available to this paper just as thousands of Ilonggos prepare to stage a local version of the #MillionPeopleMarch this morning at the Iloilo capitol grounds. TNT Libre asked an Executive Assistant of Gov. Defensor to react to this story, but received no reply as of press time. And even as President Benigno Simeon C. Aquino III tried to defuse the public outrage over the pork barrel scandal, the documents provide evidence that his own administration has its big share of the issue on the misuse of public funds. During the campaign, then vice gubernatorial candidate of the United Nationalist Alliance (UNA) Rolex Suplico had assailed what he described as the Liberal Party’s misuse of government resources to buy votes. But his protestations fell on deaf ears. Based on the initial batch of documents, the misuse of the pork barrel to advance the political agenda of the Aquino administration reached gargantuan proportions. 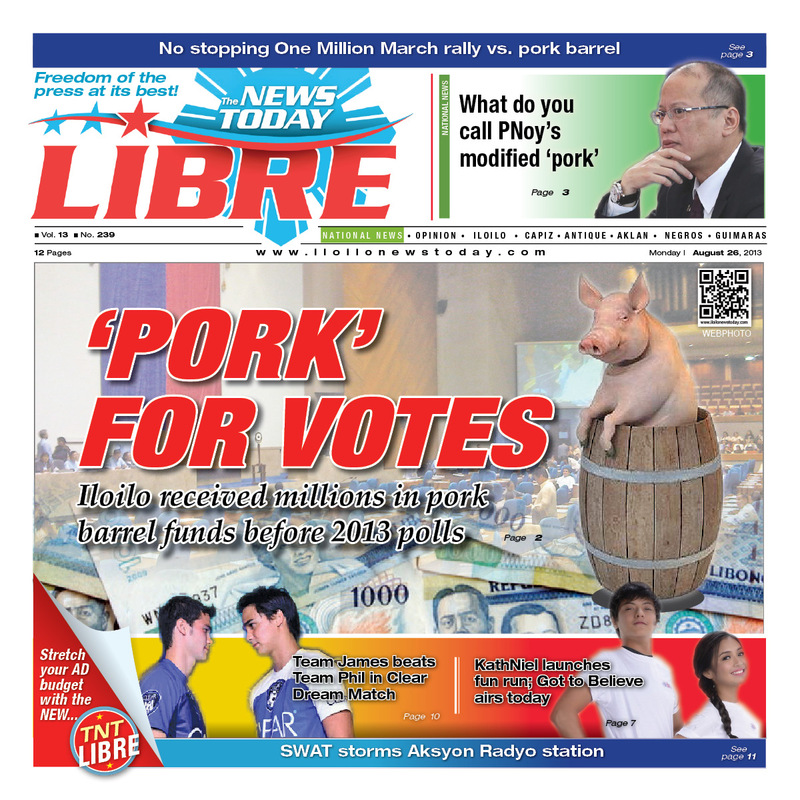 The documents made available reveal that at least P77 million of the pork barrel was disbursed just last March 2013 just before the campaign period started. “It is more in the level of P100 to 120 million,” said a source from the DBM. Senate President Franklin Drilon, who was then general campaign manager of the LP, was pinpointed as the architect for the allocation and disbursement of pork barrel funds for political campaigning. Twitter messages asking for his comment to his @frankahan account on the issue over the weekend were unanswered. Six municipalities in the second congressional district of Iloilo partook of a P24.15 million package for various projects, another Special Allotment Release Order (SARO) issued by the Department of Budget and Management (DBM) showed. The LGU of New Lucena, Iloilo got a share of P5 million, P2 million for Sta. Miguel, 5 million for Sta. Barbara, P5 million for Leganes, P2.5 million for Alimodian and P4.45 million for Zarraga, Iloilo from this package. The special allocation for the second congressional district was intended to bolster the candidacy of Pavia municipal mayor Arcadio Gorriceta for the congressional seat then held by Augusto Boboy Syjuco, a source revealed. Drilon and Gorriceta are considered “best friends”, which goes a long way back to their high school years. Because Alimodian’s incumbent municipal mayor was supporting the candidacy of Dr. Ferjenel Biron of the United Nationalist Alliance (UNA), its allocation was channelled through the Iloilo provincial government and given directly to the barangays that expressed support for the Liberal Party, it was disclosed. Only the municipality of Leon was excluded in the second congressional district along with the LGU of Pavia from this package. “Leon was omitted because its municipal mayor and all barangay captains refused to shift their support to the congressional candidate of the Liberal Party in the district, Arcadio Gorriceta,” a source who was privy to the “cutting up of the cake” said. Leon was committed to support 1-CARE party list Salvador “Kiting” Cabaluna III. It was largely because of this pork barrel kitty that Gorriceta achieved victory at the elections in the three-way battle. Syjuco came in third. AAMBIS/OWA party list congresswoman Sharon Garin received a portion of her 2013 PDAF (official name of the pork barrel is “Priority Development Assistance Fund”) also in March in the amount of P5.070 million, all of which was funnelled into the LGU of Guimbal. “The LGU has no business managing the funds from the pork barrel when its beneficiaries are from outside its territorial jurisdiction,” she said. In a text message, Rep. Garin defended the action. “Guimbal is one of the beneficiaries of this project. Channeling the project to one of the beneficiary LGUs is allowed. Check DBM guidelines for this,” she said in a text message. The Garin family jumped into the Liberal Party bandwagon along with Defensor just last year. The funds were distributed to the following LGUs: Dumangas (23 barangays), Passi City (26 barangays), Banate (16 barangays), Anilao (3 barangays), Barotac Nuevo (7 barangays), Duenas (2 barangays), San Enrique (8 barangays), San Rafael (8 barangays), Barotac Viejo (26 barangays), Concepcion (5 barangays), Ajuy (13 barangays), Lemery (5 barangays), Balasan (10 barangays), Batad (10 barangays). In addition to these pork barrel releases by the Aquino administration, Drilon also allocated P30 million to the municipality of Sta. Barbara, Iloilo in September last year for the construction of a 3-kilometer road and P6 million to the municipality of Oton, Iloilo for a drainage project in barangay Cagbang. Both PDAF disbursements were deemed part of Drilon’s strategy to solidy the Liberal Party’s machinery in preparation for the elections.